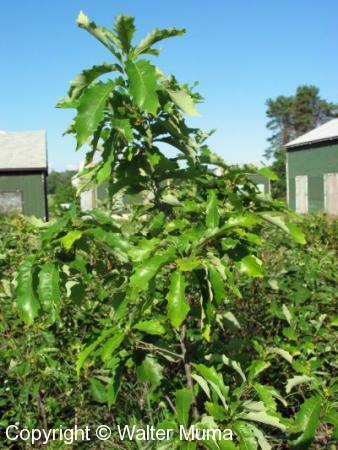 Distinctive features: Shrub; It's basically a miniature version of Chinquapin Oak (Quercus muehlenbergii).  Chinquapin Oak (Quercus muehlenbergii) - a tree; larger. Habitat: Fields and Open Areas; Open areas, open woods. Sandy soil. Status: This shrub is rare in Ontario, occurring indigenously only in three sites: Grand Bend on Lake Huron, Point Pelee on Lake Erie, and the sand plains of Walsingham Township (near Long Point, also on lake Erie). Photographs: 71 photographs available, of which 5 are featured on this page. SCROLL DOWN FOR PHOTOGRAPHS. This plant is about 6 feet tall. 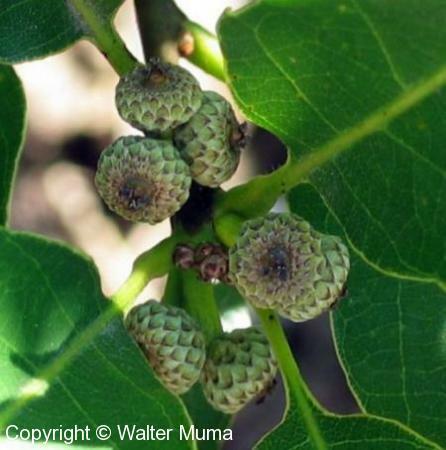 It is mature, as it is producing acorns. This plant is located on a native plant nursery on the Walsingham Township sand plains. Leaves at the top of a stem. Acorns in July (not yet fully formed).